Description: This poster is an offset litho in black and red, produced by the ECC, Johannesburg. 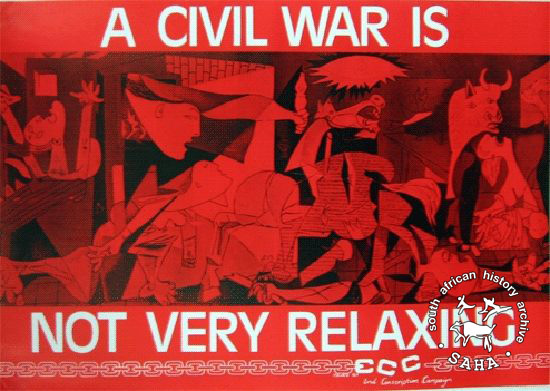 This poster uses the image of Picasso's 'Guernica', created to express his anguish at the Spanish Civil War, as a means of bringing home the horror of civil strife in South Africa. 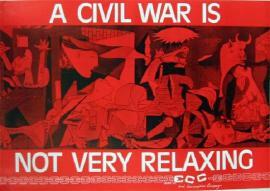 The text reads: "A CIVIL WAR IS NOT VERY RELAXING". This poster was digitised by Specialised Archival Solutions in 2009. Reproduced in "Images of Defiance: South African Resistance posters in the 1980s" on page 129 (number 227) of the 1991 SAHA / Ravan Press edition and the 2004 SAHA / STE Publishers edition. It also appears on page 184 of “Red on Black: The Story of the South African Poster Movement”, SAHA / STE Publishers, 2007, as well as the SAHA virtual exhibition - 'The Future is Ours: Commemorating Youth in the Struggle'. Rights: Copyright of some materials is held by individual postermakers/organisations. Copyright restrictions may apply. See SAHA copyright statement for more information.